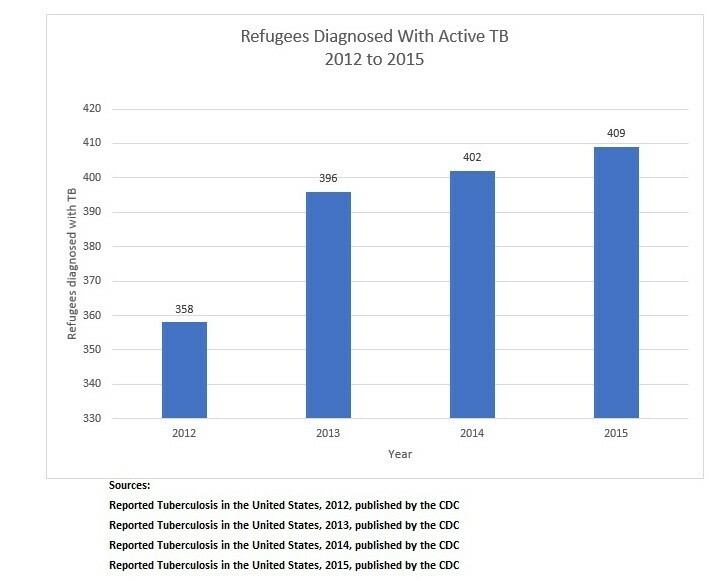 Until Breitbart News discovered the public, but effectively hidden, CDC reports, the scale of the TB problem among refugees was underreported by more than 1,000 cases over recent years – off by a factor of more than three. The number of refugees resettled annually in the United States increased from 58,238 in FY 2012 to 69,933 in FY 2015, according to the Office of Refugee Resettlement. The number of refugees resettled in FY 2016 increased to 84,995, according to the Department of State’s interactive website. During the first three months of FY 2017, the number of refugees resettled in the country increased to 25,671, almost double the 13,791 resettled during the first three months of FY 2016. The increase in the number of refugees diagnosed with active TB from 358 in 2012 to 409 in 2015 was partially responsible for the increase in the total number of foreign-born cases of active TB increased from 6,274 to 6,350 during those four years. Other categories of foreign-born cases of TB that increased included those who arrived under regular immigrant visas, which increased from 1,437 in 2012 to 1,670 in 2015, those who arrived in the “other” category, which includes illegal immigrants (called “undocumented immigrants” in the CDC reports), which increased from 1,312 in 2012 to 1,408 in 2015, and those who arrived under student visas, which increased from 158 in 2012 to 191 in 2015. 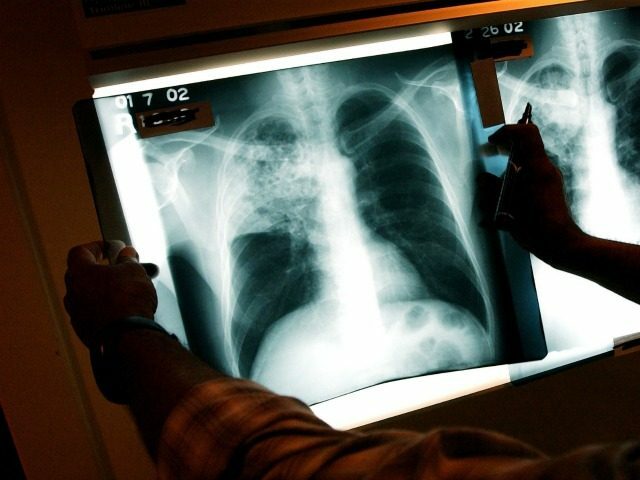 Foreign-born TB cases as a percentage of all TB cases diagnosed in the United States increased from 63.1 percent in 2012 to 66.4 percent in 2015. The total number of TB cases diagnosed in the United States declined from 9,945 in 2012 to 9,421 in 2014. In 2015, however, for the first time in 23 years, the number of TB cases diagnosed in the United States increased, instead of declined, to 9,557. (1) Several of the 35 states for which no data was previously available about the number of active TB cases among refugees have a significant, and previously unreported, public health problem associated with unusually high rates of active TB among refugees. Georgia, for instance, is the most surprising untold story. During the four years between 2012 and 2015, 96 cases of active TB were diagnosed among refugees in the Peach State. On a per capita basis, Georgia has one of the highest instances of refugee TB of any state in the country. Yet nowhere has this important story been reported. Texas is known to have one of the highest rates of foreign-born TB in the country. What was not previously reported, however, is the significant role refugees have played in that phenomenon. During the four years between 2012 and 2015, 186 cases of active TB were diagnosed among refugees in the Lone Star State. Similarly, it has been widely reported that TB is a public health issue in California. Breitbart News was unable to obtain the full story from the California Department of Public Health about the number of refugees diagnosed with active TB in California until discovering the CDC annual reports. We had only been able to document three cases of active TB among refugees in California based upon publicly available data from the state. The CDC data, however, makes clear that California has a significant problem with active TB among refugees. During the four years between 2012 and 2015, 251 cases of active TB were diagnosed among refugees, which is 248 more than the three cases previously reported. Breitbart News will provide a number of additional reports based on the data contained in these annual CDC reports in the coming weeks.